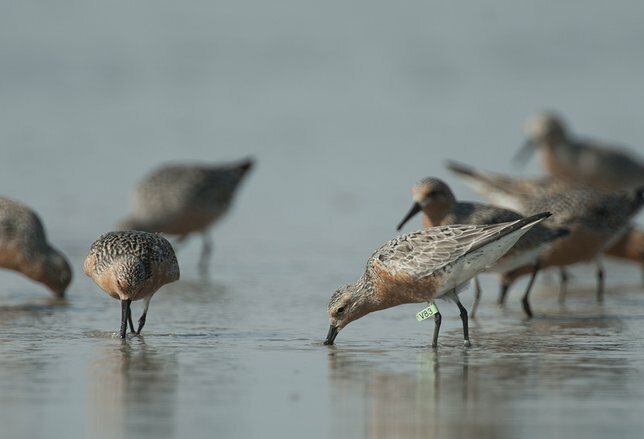 The National Audubon Society invites birders and beachgoers across the Atlantic Coast to help track the health of red knot populations by submitting band identification data on Bandedbird.org. New York, NY - May 6th, 2014 - The National Audubon Society invites birders and beachgoers across the Atlantic Coast to help track the health of red knot populations by submitting band identification data on Bandedbird.org. The combination of identification and sighting data allows researchers to greater understand the needs of these marathon migrants along their 9,000-mile annual spring journey from Argentina to the Arctic. Audubon’s effort to record the trail of red knots comes as the U.S. Fish and Wildlife Service is considering a proposal to list the shorebirds as “threatened” under the Endangered Species Act. The proposal is open for public comment until May 19. Red knots are beginning to arrive along the Atlantic Coast as part of their spring migration. Smaller than a city pigeon, red knots are one of North America's most colorful sandpipers with non-stop intercontinental flights that can last as little as eight days. During their journey north, red knots concentrate on beaches at traditional staging grounds in both South and North American shores to rest, recover and fatten up before embarking on the next leg of their migration on to Arctic breeding grounds. Many stopover on beaches in Florida, Georgia, the Carolinas and Virginia before reaching Delaware Bay where they feed on the billions of horseshoe crab eggs, a primary food source, that line the shores. Tracking banded red knots during their East Coast stopovers is critical to efforts to protecting the shorebirds and reversing their dramatic decline. Band sighting has helped confirm that red knot numbers have plunged about 75 percent since the 1980’s. This is due to the increase in harvesting of horseshoe crabs for medicinal purposes as well as habitat loss caused by beach development and sea level rise. Since the mid 1990’s, an international team of scientists have banded thousands of shorebirds, the majority including red knots. Color-marking these birds has resulted in a growing database of sightings along the Atlantic Coast describing their migration routes, nesting and wintering areas. This banding system taught researchers that red knots have one of the longest and arduous annual migrations on the planet, over 9,000 miles between their wintering grounds in far South America and their breeding grounds in the Canadian Arctic. One of the most popular red knots is B95, named for his leg band number. He was nicknamed "Moonbird," because researchers calculated this bird has flown enough miles to journey to the moon and at least halfway back to Earth since being tracked in 1995. Thanks to the banded red knot H5M, Audubon scientists discovered that some red knots stopover in the Bahamas. H5M was originally banded in May 2008 at Moores Beach, NJ. It has been since seen five times along the East Coast but was never recorded internationally until Audubon scientists recently sighted it on the Joulter Cays in the Bahamas during fall migration. Audubon’s research has also discovered that some red knots spend the winter in the Bahamas. Audubon hopes to uncover more about the importance of the Bahamas to migrating and wintering red knots and other threatened shorebirds. Audubon is asking for the public's help in identifying and collecting basic banding information about red knots. Participants can get involved as frequently as they wish by entering sightings of banded birds on Bandedbird.org from their favorite shores. Observers should count the birds they see and note whether they are banded, flagged or not. The key goals in surveying shorebirds are to identify and record the species, location, flag color, flag character code, color bands, and the precise position on legs. Spectators are urged to use caution and prevent disturbance to the birds when viewing and tracking them. For more information visit www.bandedbirds.org. Red knot information may also be submitted to www.eBird.org. Photos by Walker Golder, National Audubon Society. Subject: LongIsland.com - Your Name sent you Article details of "The National Audubon Society Invites Beach Lovers to Help Track Banded Red Knots"